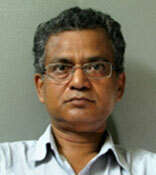 Dr. Debdarpan Khan, Associate Professor in Geology, did his B Sc. (Hons), M Sc. ( Applied Geology) & Ph.D. from Jadavpur University. He has taught Geology at Durgapur Govt. College from 1999 to 2006. From 2006 to 2013 he was posted as Deputy Director of Public Instruction and Joint Director of Public Instruction at Education Directorate, Govt. of West Bengal. Dr.Khan published several research papers in different esteemed international journals.